The István Zelnik Southeast Asian Gold Museum provides a home for nearly a thousand artifacts from eleven of the states of today's Southeast Asia. Most of these objects are of gold and date from prehistoric times to the 20th century, illustrating the spectrum of fine arts in Southeast Asia over the past two thousand years. In addition to the treasures it displays, the Gold Museum presents the realms of culture and art in this colourful and multifaceted region. The museum halls lead the visitor across the eras of Southeast Asian art and present its exceptional wealth. 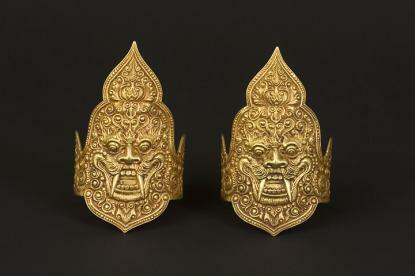 The mainstays of the collection are the gold and silver artefacts from Cham, Khmer, Javanese and tribal cultures. The collection of religious objects, statues connected to Buddhism and Hinduism is also outs standing. This is why these two world religions are addressed in the hall and two further rooms on the ground floor of the museum. Representations connected to Buddhism can be found in all sections of the collection: Buddhas and Bodhitasattvas (enlightened spiritual guides) present the cultic objects of the living religion of Buddhism through its cultural influences and the many aspects of material and form. Hindu deities: Indian influences have affected the region's art significantly since the 5th century. The themes of Hindu art are almost entirely religious in nature, and the abundant and colourful world of the gods and a wealth of mythology offer an inexhaustible source of inspiration for representation. The most typical are the gods and goddesses who appear with a variety of forms and names, and also, to some extent, animal deities. The multicoloured character of the civilisations in the area have been enriched by Southeast Asia's own trade network, which existed alongside the Central Asian Silk Road, that is, the 'Maritime Silk Route', and it was similarly important. Trade on these routes is shown in a separate exhibition hall, where the many distinctive goods it distributed can be seen, including gemstones, silk, porcelain and precious metal objects that changed hands within the trade network. The upstairs halls of the museum house groups of objects that offer a view of the Cham, Khmer and Javanese court cultures, as well as the refined art of smithying in the tribal cultures of the mainland and the archipelago, mainly through gold objects. There is also a separate hall here dedicated to the Shiva cult within Hinduism because of the particular importance it gained in Southeast Asia. The influence of Islam from around the 12th-13th centuries can also be felt in various groups of objects. In the cultures of Southeast Asia the notion of 'treasure' has a deeper meaning. The ritual and high-art objects made from the most precious materials, gold and silver, sprang from the deepest teachings of religion because they were intended to make inner content and spiritual value apparent. Each and every one of the artefacts placed in the Hall of Treasures is a spiritual treasure in the deepest sense, whilst also guiding the visitor to an interpretation of the meaning of secular treasures. István Zelnik's collection is a genuine contribution to our knowledge of court and tribal cultures, religious and art traditions in Southeast Asia, whilst also serving us with completely new information. The collection, through its completeness, is able to offer a picture of the region's culture, to add to what were until now isolated pieces of information, adding precision and shedding new light. A Tropical Statue Garden and an Asian Teahouse also await guests at the Gold Museum located on the museum axis of Andrássy Avenue (in the former Rauch Villa).